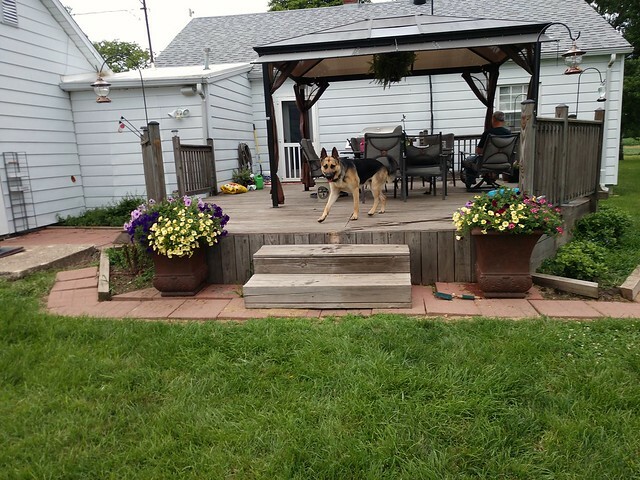 In Illinois Sarah is enjoying outdoor living. She and her husband Steve made what turned out to be a simple change to improve their enjoyment of one of their favourite outdoor spots. I’ve mentioned several times that Steve and I like to spend a lot of time on our deck. We designed and built it the summer of 2013. Then two years later we cleaned and sealed it. We have gotten so much use out of it, whether it is just Steve and mefr or one of the several the birthday parties, 4th of July parties and girl’s night that we have had on the deck. As much as we have used the deck, Steve had noticed that it could be improved. When we designed it we had two sets of steps: one directed towards a door of the house that we use often and one directed towards our garden. However, after a few years of use Steve pointed out that we could really improve the flow if we moved the steps. What first seemed like a huge undertaking was really a quick change up. 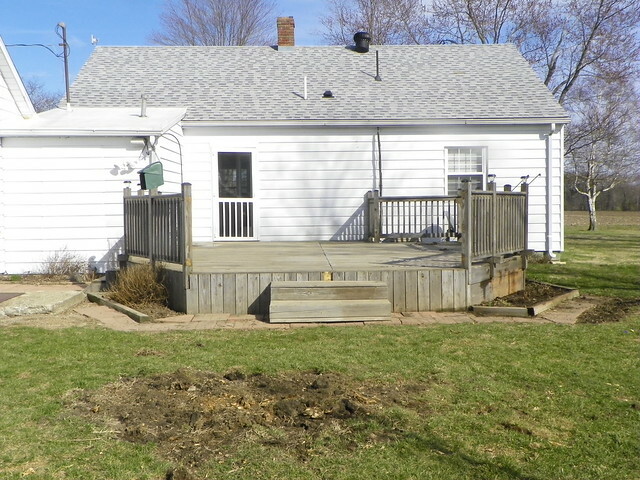 Thankfully the steps were built independently of the deck so after removing several deck screws the whole set of steps easily moved. Then taking a few screws out of the railing and using a circular saw to cut it down we were easily able to replace it where we had removed the steps. Thankfully Steve has really good vision, because when he mentioned doing this I thought it was going to be a whole day of work and honestly it took less than an hour! Moving the steps to a longer side did bring up a small issue. The stairs were narrower than the opening. Steve and I both felt that some tall planters would guide people towards the stairs and a railing wouldn’t be needed. Also I had to divide and move my mums around to fill in where the steps had been. We still need to decide what material and where we want a walkway but overall we are thrilled with the changes. 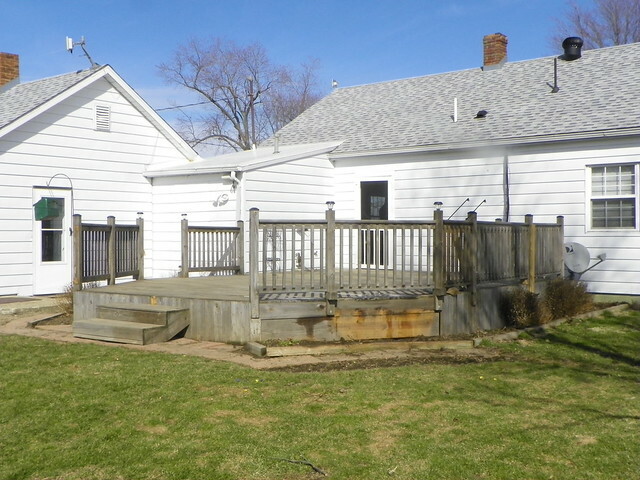 The deck just feels like it makes more sense this way and we sure like to spend time sitting out there and enjoying each other’s company. Do you have a gathering spot at your house? Ever had a project that just wasn’t working and you made the decision to rework it? 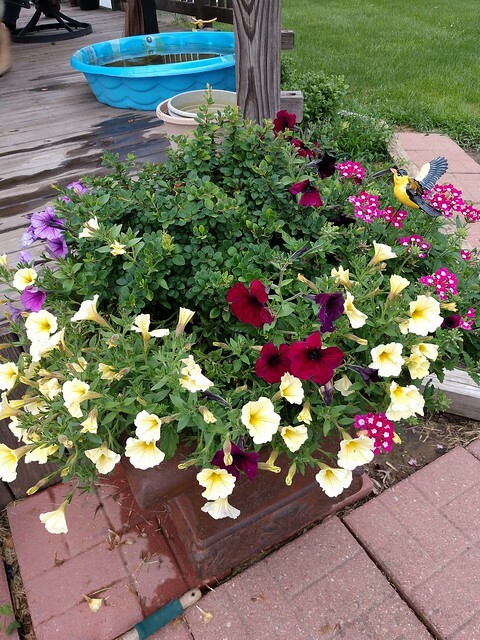 What flowers would you use to fill those big pots? What a great switch, Sarah. I’m impressed that it was such an easy change for you. The planters are a good solution. Our vegetable garden is very delayed this year–and still mostly to be determined–thanks to Ellie. So I’m living vicariously through other people’s gardens. Sarah has made it through the early uncooperative weather that delayed her garden start. Planting has officially happened in Illinois and she’s sharing the details today. If you read my last post, I mentioned that we finally made our way out of winter. Which means we had to jump quickly into planting the garden. We were about 4 weeks behind our normal planting time. 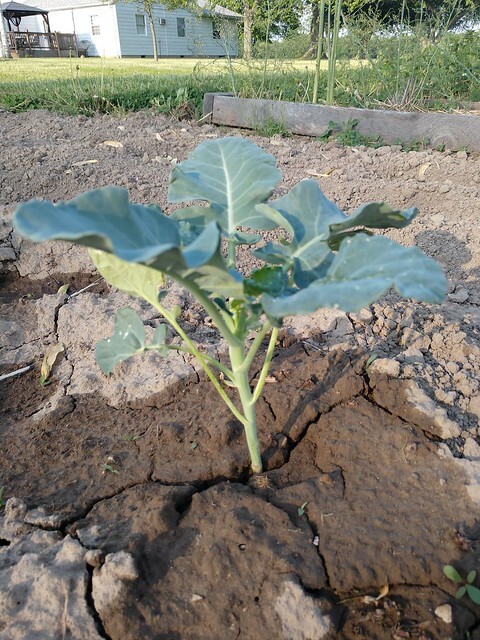 As an example, we usually try to plant potatoes on Good Friday (this year March 30) and we were not able to get them into the ground until April 29. Another problem that we are facing is that we seem to have jumped directly from winter to summer. We went from cold days and many nights of frost to 85F (29C) every day. 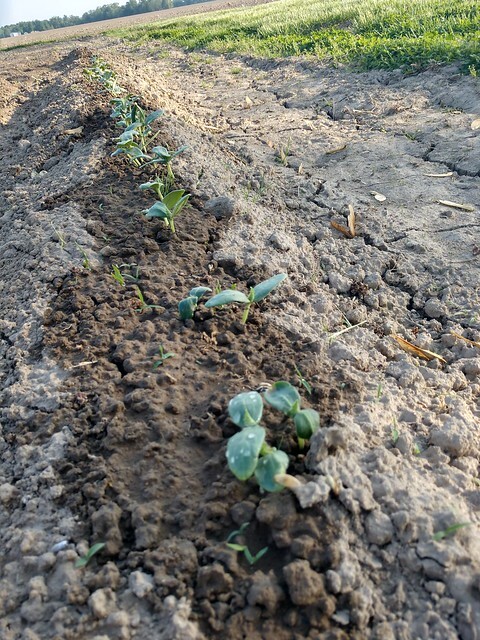 This is hardest on some of the colder weather crops like lettuce, kale, radish and possibly carrots. I went ahead and planted them but, they aren’t looking very hopeful. And even though they got such a late start, I think the potatoes are going to make it. 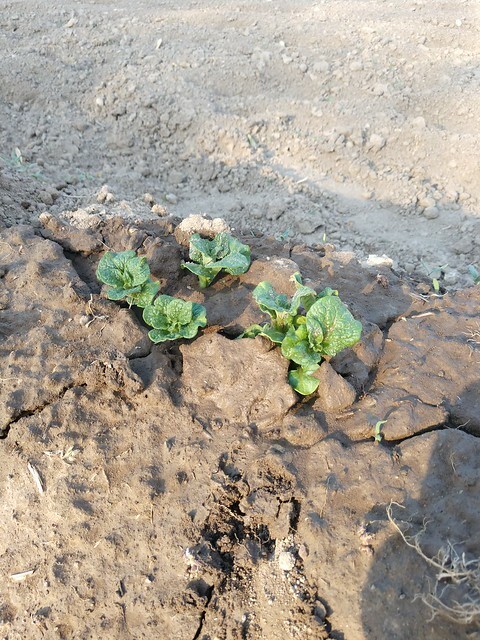 Another issue we are having is that it has been very dry. So every day after work I fill two 5 gallon buckets twice and carry them out to the garden and water each individual plant. There has been some discussion between Steve and I on running a water line out there. If that happens, I will be sure to document it! 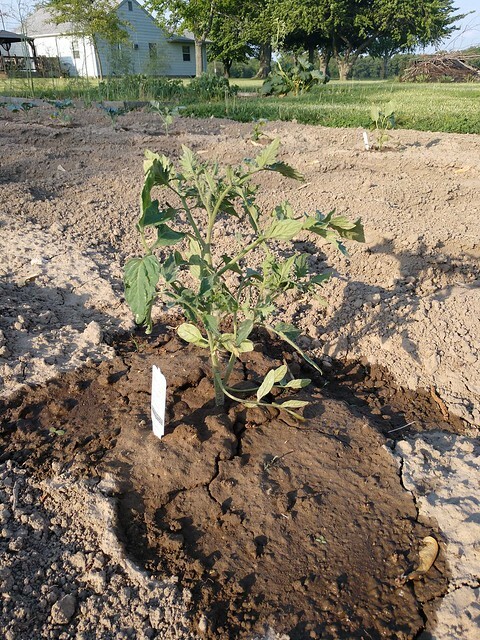 Have you started planting anything where you live? Are you having any struggles with your vegetables? Temperatures? Rainfall? Do you get a workout by hauling water to your garden? That’s a lot of water lugging, Sarah! I definitely vote for a water line, but in our experience running the line is probably as much work as hauling water all season. Perhaps rent a small backhoe if you decide to put one in. We transplanted a tree this weekend, so we’ve been hauling buckets, as there’s no way a hose will reach the spot I chose. 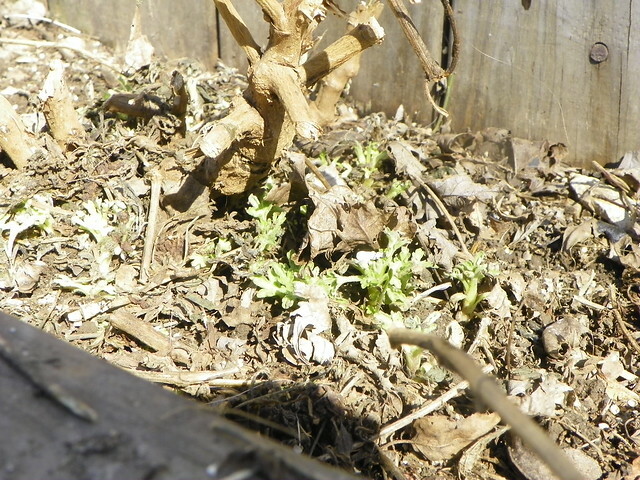 That seems to be the extent of our gardening so far, so I will continue to enjoy your updates. Good job with all of your planting! Spring seems to be taking its time coming this year. 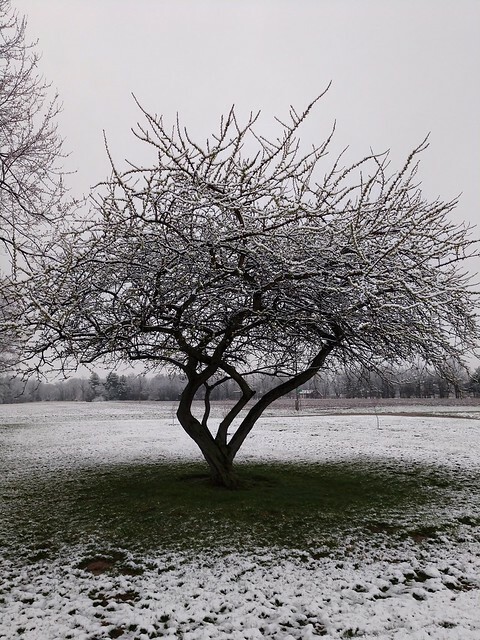 A late-season ice storm meant that less than a week ago, the farm was still covered in snow. Conditions in Illinois are the same. 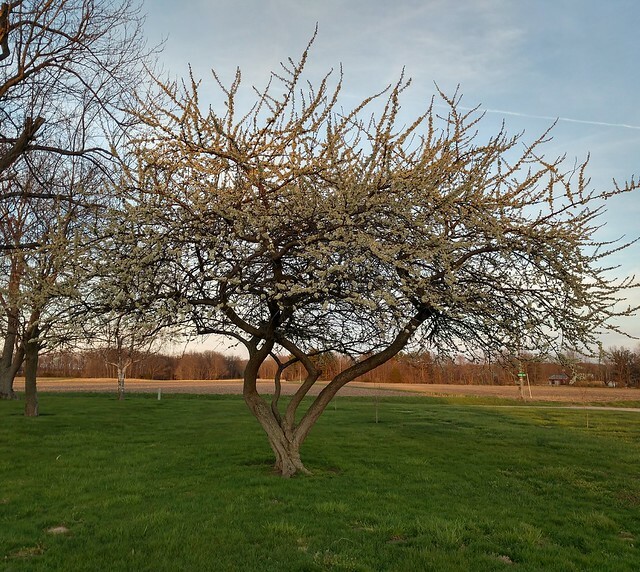 Sarah in Illinois uses a calendar to track her annual progress in the garden, and she knows exactly how delayed the season is this year compared to last. She’s sharing her calendar–and lack of progress–today. For someone who loves spending time out in the garden, this spring has been pretty frustrating. Two years ago I tilled the garden on April 16 and last year I tilled it for the SECOND time on April 15. This year weather has prevented us from stepping one foot in the garden. Now obviously I can’t do a thing about the weather, so I try not to let it upset me very much. Plus there are sure signs that the weather will warm up. Has spring arrived where you live? 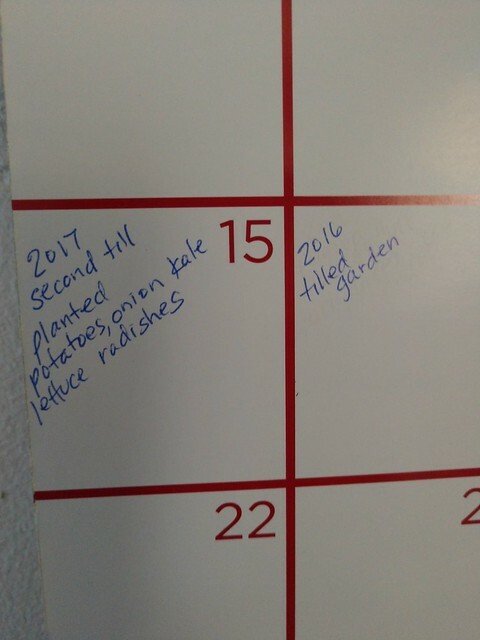 Do you keep a gardening calendar or something similar? Have you been able to start working in your garden? Oh Sarah, I feel your pain. 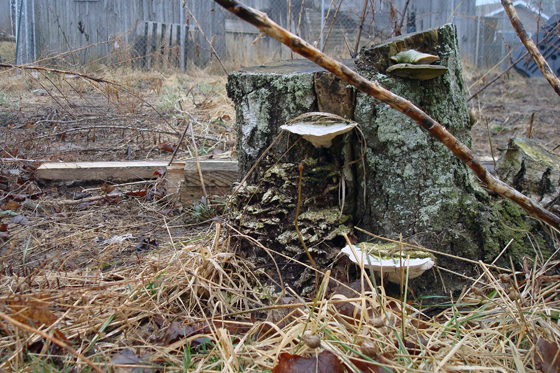 We had sunshine over the weekend, and things not only melted, they finally started to dry out. I’m not sure that spring is officially here, but it seems like it might come someday… probably… hopefully. We are officially a week away from the first day of spring. (Is anyone else boggled by the fact that we’re already halfway through March?) 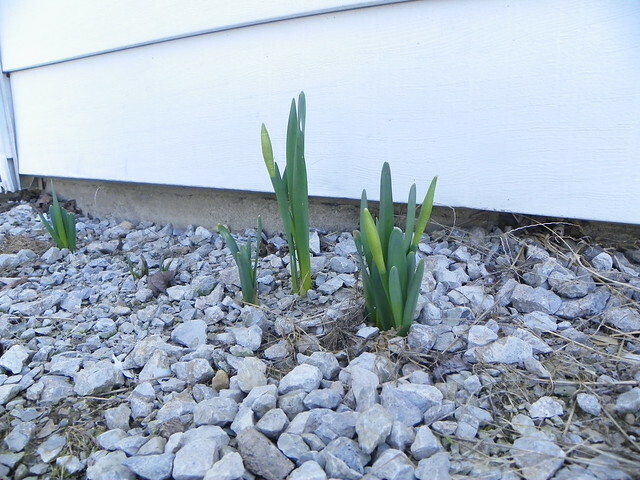 Sarah in Illinois is here today, sharing some of the signs of spring that have popped up at her property. The temps are still too cool to actually do any kind of gardening outside. 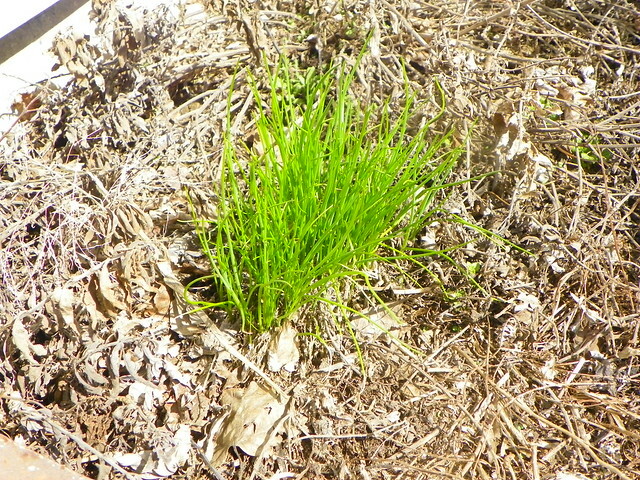 But while taking a tour around my yard over the weekend, I could see many signs of spring. First, right outside my backdoor was a clump of chives that looks like they could be used right now. The daffodils once again have fought their way through the gravel that we put down. 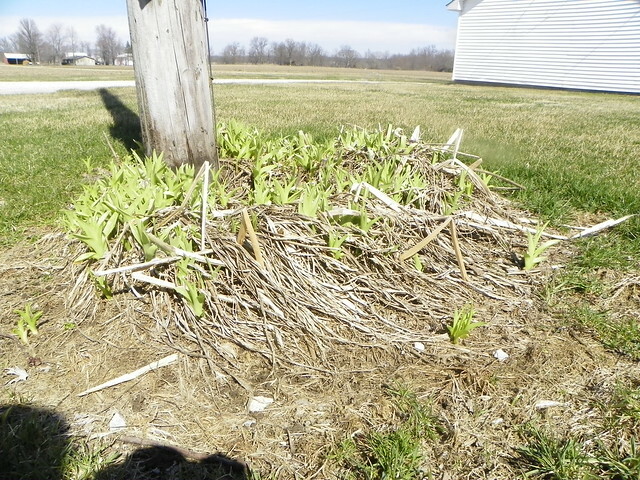 The lilies are coming up through the old growth and reminding me that I still have a lot of yard clean up to do. 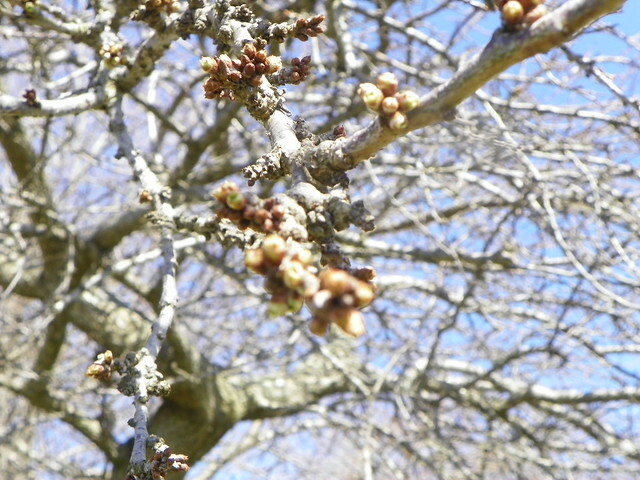 The plum tree has some promise of buds to come. 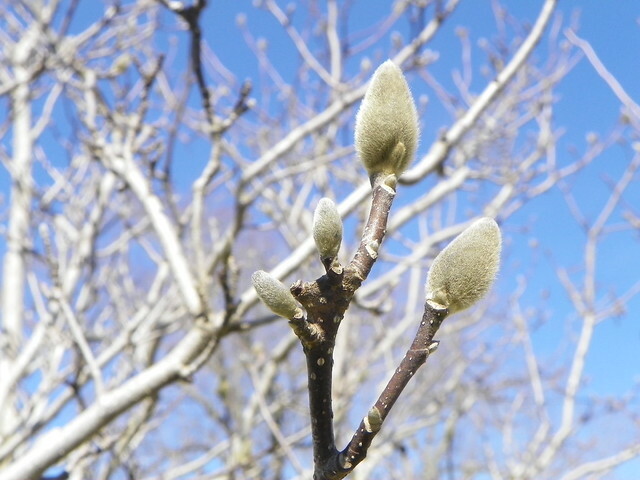 The magnolia out front has some beautiful buds starting. Even my mums are reaching for the sunlight. And finally out in the garden, my strawberries are reminding me that time in my garden is not that far away. What signs do you have that remind you that spring is coming? Can I say I’m glad I’m not the only one starting the season with garden clean-up yet to do, Sarah? Your lilies look like they could be any number of spots at our place. We’ve had snow flurries every day this week, so I haven’t done a formal tour yet, but I’m hoping to see some more signs of spring soon. Thanks everyone for your good wishes on our new addition. We’re excited–and I will admit I’m still a bit nervous about this whole baby thing too. We had our pre-natal class this weekend, which was informative and encouraging, and I have (yet another) ultrasound this morning (this baby is going to have supersonic hearing after all of our scans). Overall, we’re feeling pretty good about where we’re at. As you can see, 2017 was quite a year for us. Today I’m taking a minute to look back at the year that was from a personal, professional and farm point of view. After thinking and planning for quite awhile, I took a leave of absence from my communications job at the end of August to spend some extra time with family and see if I could build my own communications consulting company. I love working from home and love working for myself. I’m still working on building my client base, but I’m so grateful to have this opportunity. The timing for my leave turned out to be very fortunate, as at the start of July we found out we were going to have a baby and at the end of September Matt was diagnosed with an ocular melanoma. It’s been so helpful to have a more flexible schedule for appointments and most importantly to have the mental space to process and reflect on all of the changes in our lives. Along with all of that, we’ve replaced both our cars–my 14-year-old girl finally died and Matt’s year-old car was written off after he was hit by a driver who ran a red light. Matt ended up with a broken arm courtesy of the airbag, which derailed some of my plans for projects around the farm, but was a small hardship when he could have been much more seriously hurt. Amongst all of these changes and challenges, the farm has been our constant and our refuge. 2017 marked five years at the farm, and I can’t imagine being anywhere else. It gives both of us peace to be here, and also gives us an outlet when we need to distract ourselves with tractor therapy, digging in the dirt, painting something or just walking the property. I have a feeling we’re going to be saying, “What a year!” for the next while (perhaps the rest of our lives?) as we watch this baby grow, adjust to our new family reality and continue with life on the farm. 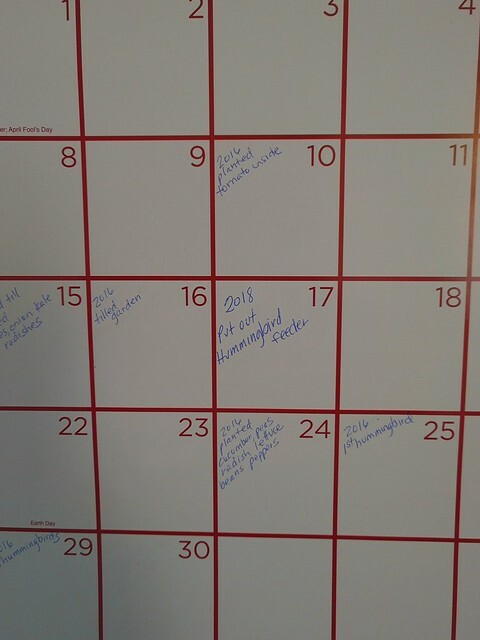 As many of us do at the start of the year, I like to take a moment to look back and reflect on the year past. Beyond all of the personal changes in our lives, I also started 2017 with my usual list of Home Goals I wanted to accomplish at the farm over the year. Looking back, we didn’t do too bad. I was very happy to finish the final bedroom at the farm and finally unpack all of our moving boxes–only five years after moving in. Reupholstering my grandmother’s vintage slipper chair is a project I’m still very proud of. What I called my office ended up being more of a craft room and it was such a great space for creativity. I say “was” because my office ended up seeing another makeover just a few months later when I decided to turn it into the baby’s room. I’m finding other spaces to be creative around the house, and I love how the baby’s room is coming together. I’ll be sharing all of those details soon. 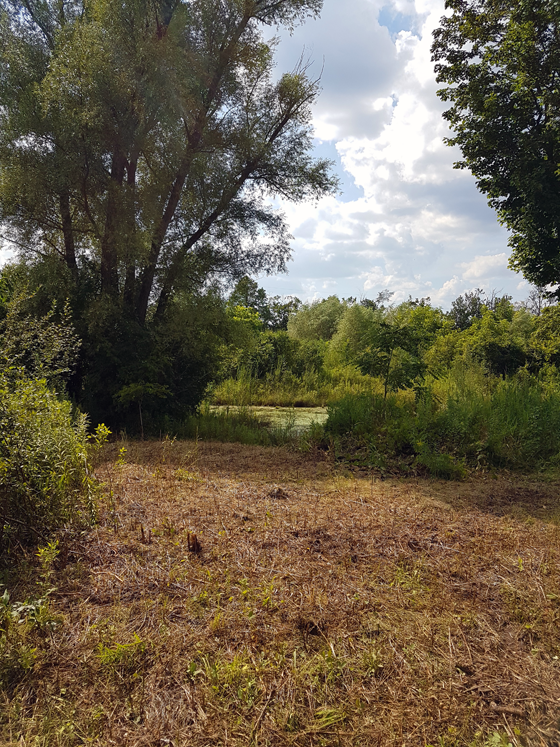 The pond shore was my one and only outdoor land clearing goal for the year (and we have plenty of spaces that I want to clear). Mid-year, I gave up on it happening, but then an enthusiastic nephew and a generous husband went to work over a few weekends, and we made more progress than I ever expected. There’s still more to go, which might be difficult as I don’t think the baby will be as helpful as our teenage nephew, but Matt and I may be able to divide and conquer on this one. 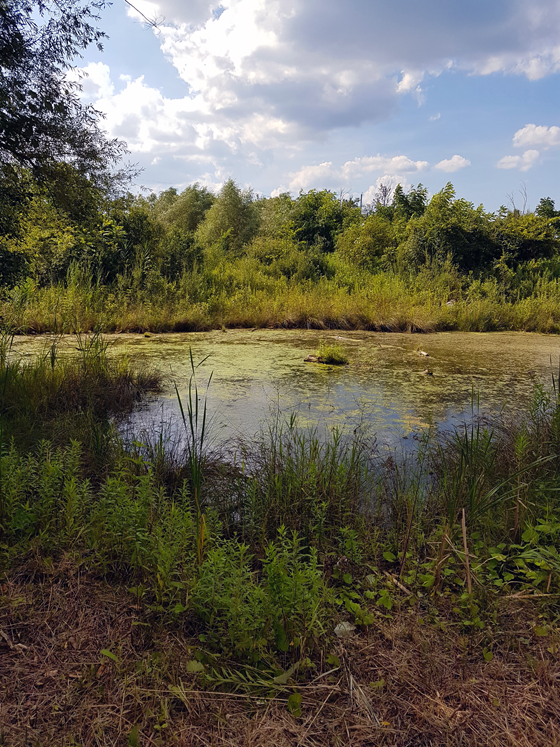 And regardless, every time I look out the kitchen window or walk past the pond with Baxter (which happens at least once a day), I’m grateful for the improved view and access to the water. 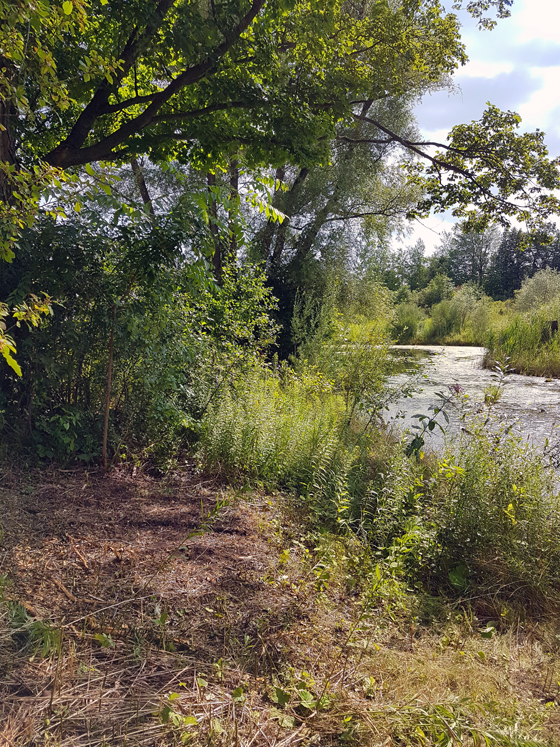 While I had planned to focus just on the pond shore, I did give the area right behind the house a bit of attention, and cleaned up (most of) the jungle that’s been there since we moved in. At the start of last year, I said I was going to add rhubarb (check), a second row of berries (check–ended up being blackberries) and maybe some more grapes (check). I also put in four blueberry plants to try. As usual, I’m crossing my fingers that everyone survives the winter and bears fruit this year. My biggest goal was keeping the weeds under control. I can’t say I was successful in that. 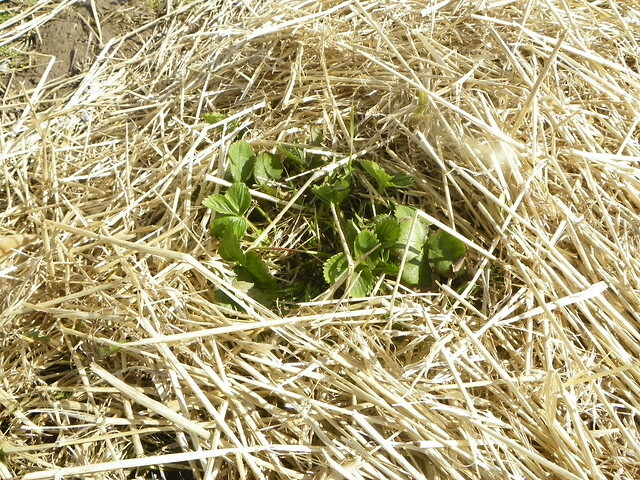 I tried to find some old hay bales for a deep mulch but didn’t have any success. 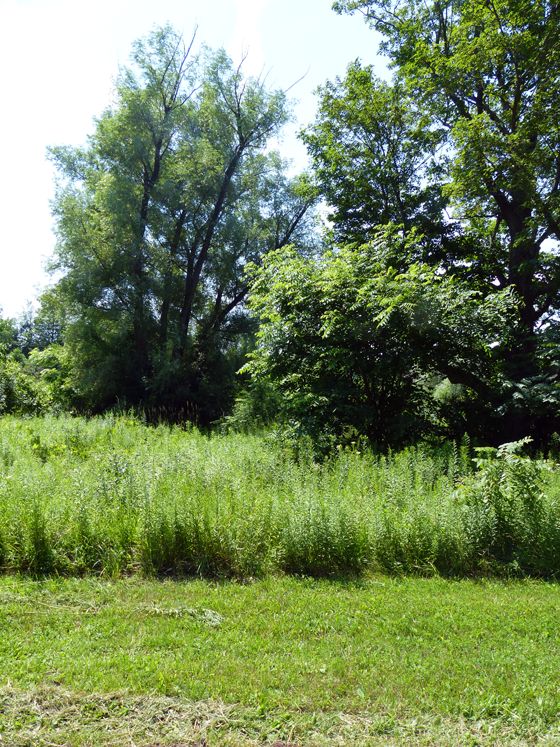 And in terms of weeding by hand, most of the season, I didn’t feel like weeding, and I gave into that feeling… a lot. We capped off the year by covering two of the quadrants with tarps, and my tentative plan for the coming year is to leave the tarps in place. 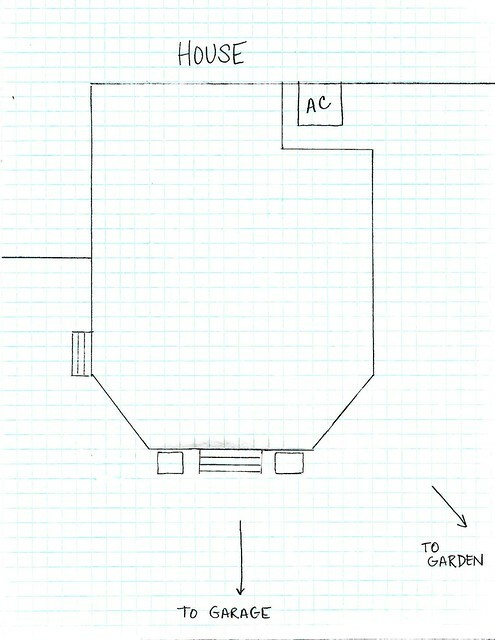 This will decrease the garden size by not quite half, which might just be manageable in our new reality. The flower gardens got some half-hearted attention this year. I can’t say I met my goal of keeping them weeded and filled with beautiful flowers, but I did get in them a few times and they didn’t look too scraggly most of the time (I don’t think). Uh, yeah. I still have empty picture frames leaning against the basement walls waiting for art. I didn’t get to this in the first half of the year, and, since I left my job, I’ve been careful about spending money on extras, even inexpensive posters. So we go yet another year with some unfinished areas in the basement. However, I did finally share the transformation of the basement TV area and all of the details on how we decorated it. I love this space so much and am so proud of us for doing it ourselves. After talking to a few people, we decided not to add a new barn cat to our family. Ralph has things under control and she’s content. She doesn’t need company, and I’m not confident that expecting her to train a young cat would work. So Ralphie gets to be mistress of the barn. She can live out her years in peace, and we will take our chances with adopting a new cat when we need it and hope that the newbie lives up to Ralph’s high standard. As always, a few extra projects sneak into every year. I can call another room completely finished–the guest room–after refinishing a vintage metal bedframe. Spoiler alert, the guest room has since seen a few more changes as it’s become guest room/sewing room as I’ve given my office over to baby. The living room also saw a few tweaks with a new mirror on the mantel and new pillows on the couch. I’ll be sharing our new coffee table soon too. So around the house, 2017 was a mix. Which is okay and pretty normal for us. We had enough abnormal in the year that I’m grateful that projects and the farm are such a refuge for us. How was 2017 for you? What was your big accomplishment for the year? I still find it hard to describe the feeling of being at the farm. It’s peace, happiness, pride, calm and so much more. My favourite place at my favourite place is the pond. Since we moved here I’ve envisioned walking along the edge of the water, a bench on the shore, maybe a little dock out into the water and a firepit. 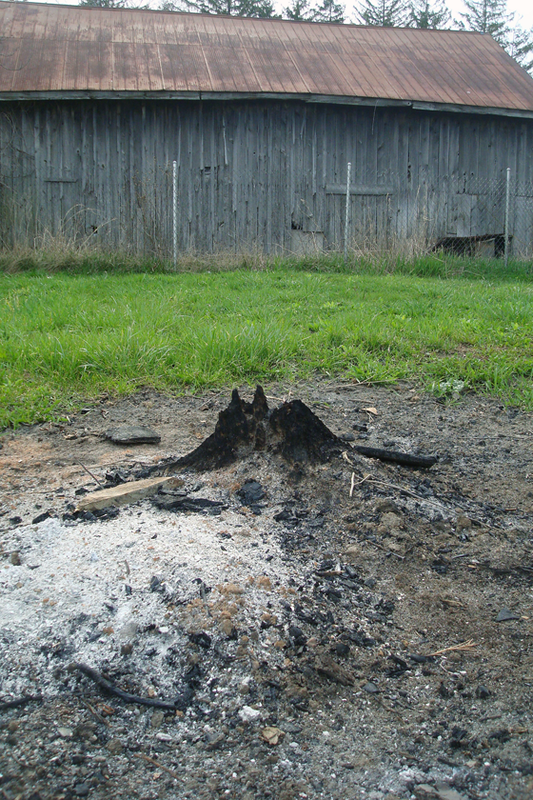 On the weekend, one part of that came true–or started to–with our very first fire at the pond. 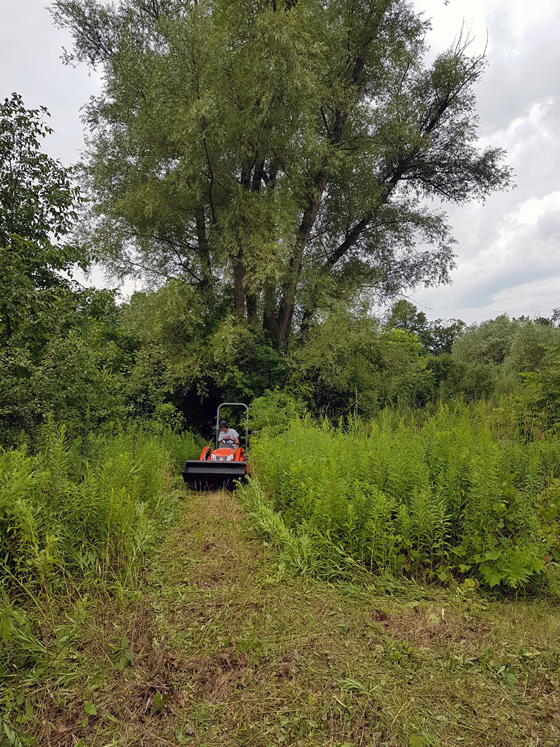 All of our efforts over the past few months with our new rotary cutter, the chainsaw, the nephew and the husband have gotten us much closer to my vision. 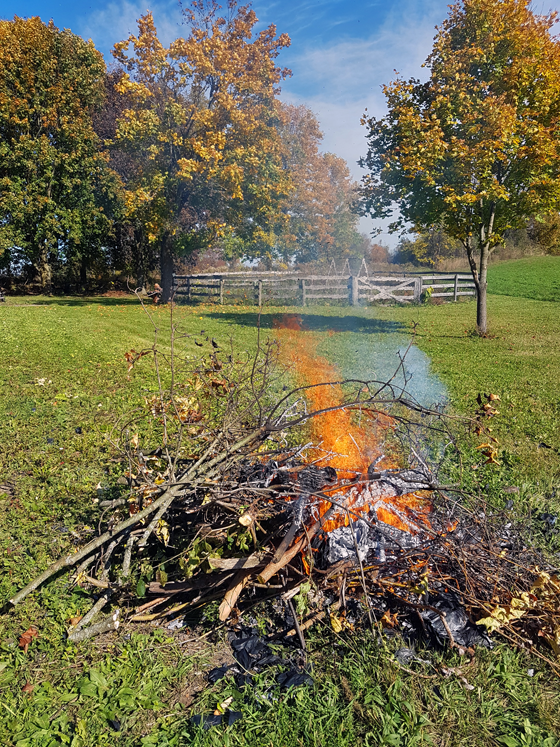 This fire was less of a campfire and more about cleaning up all of the brush that’s accumulated from our work. The pond shore was my main outdoor goal for this whole year. 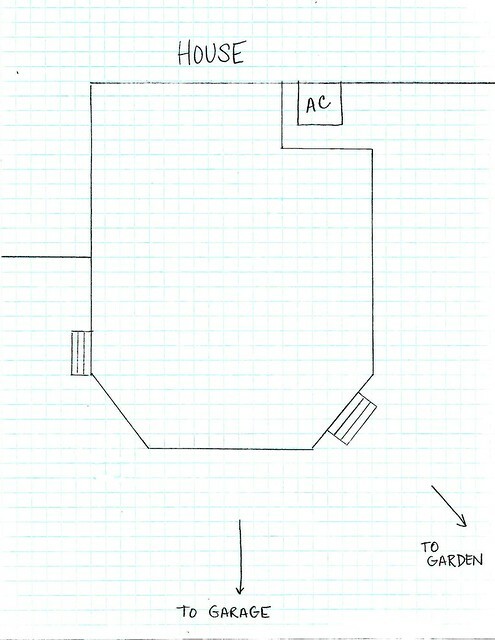 Then by June I’d given up on this plan after we ran into hiccups with a broken arm, broken chainsaw and other projects. That changed with the arrival of our mower and all of Matt’s and our nephew’s work. My fall to-do list included mowing the meadow and the shore one more time, but I’m letting that one go now. Hopefully, we can resume in the spring and push on towards my vision for my favourite place. We’ll be closer than we have ever been before. Happy September, everyone. September is my birthday month. Usually, I tend to have one thing on my birthday wishlist. In the past, Matt and our families have come together to give me my coveted Strandmon wing chair, a beautiful painting of a local landmark and our birdbath. 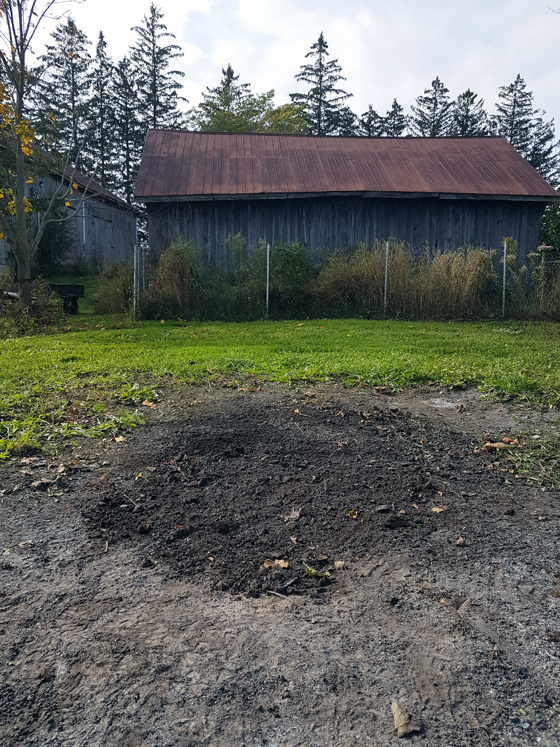 This year, I’m putting two things on my wishlist: a load of topsoil and a session with a stump grinder. Maybe not typical for birthday festivities, but much desired by me. 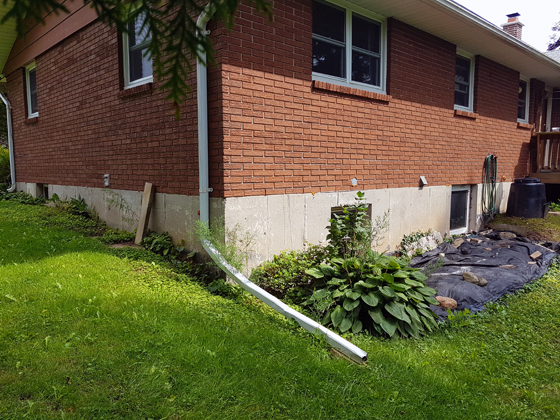 The topsoil will regrade the north and back of the house getting rid of the last of the rocks and weeds in these two areas. It would be very nice to have these two areas graded properly for water flow and have them mowable next summer. 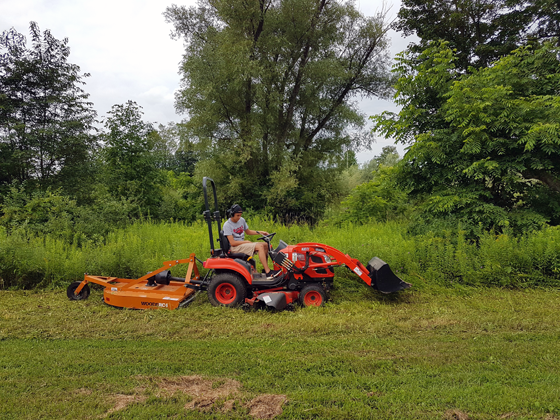 The stump grinding is also about mowing. 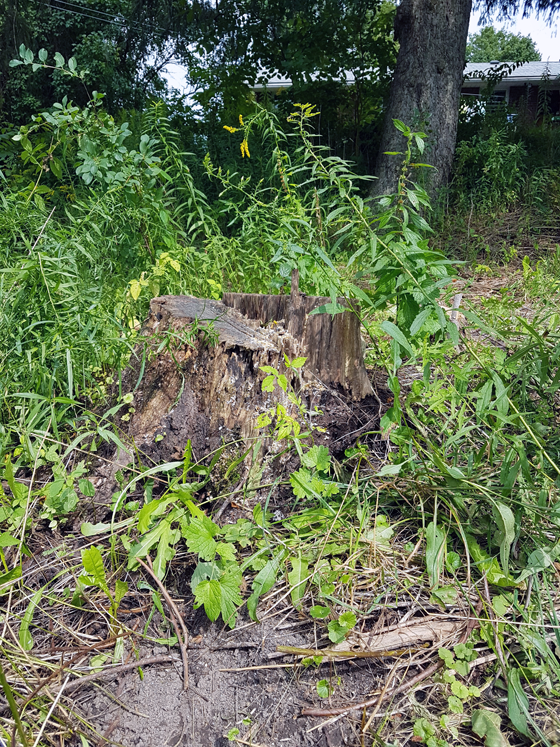 Ralph’s stump (sorry, Ralph) is my nemesis every time we cut the grass. 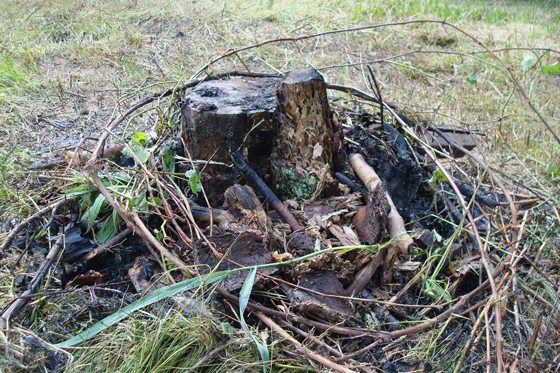 Now that we’ve cleared the meadow, a few more stumps have been revealed. They’re continuing to sprout suckers which block my view of the pond. And again, mowing around them is a pain. 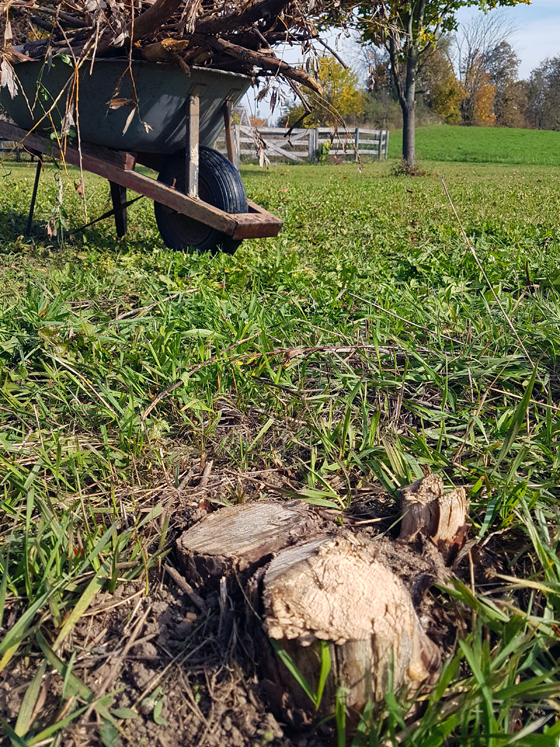 Getting rid of these stumps would be a huge part of our quest to clean up the meadow. Really, property clean-up is like a gift that keeps on giving. Yes, there’s some work involved, but I enjoy that part. 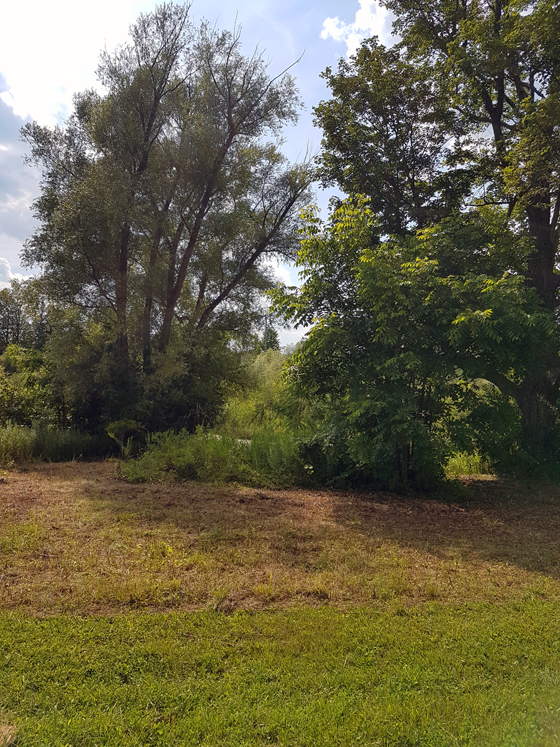 I will also enjoy my stump free meadow and weed free yard for years to come. So happy birthday to me, maybe? What’s the oddest birthday gift you’ve ever asked for or been given? 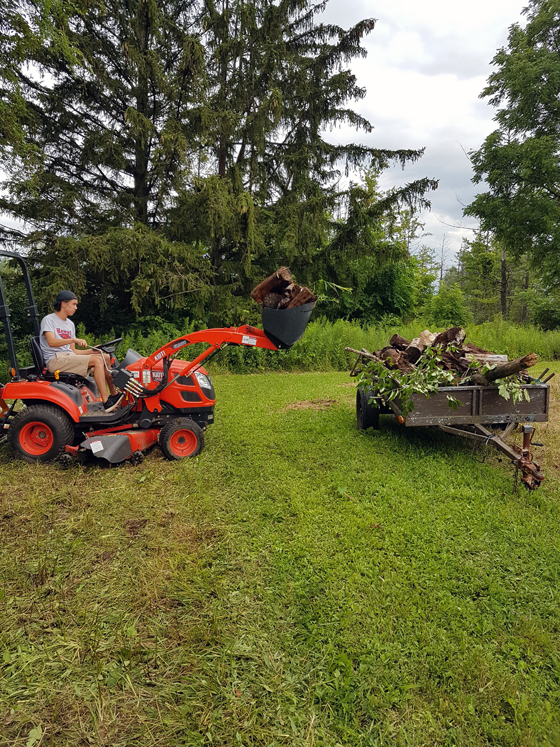 Have you ever used a stump grinder? I’m curious to see one in action.